“You can’t take it with you.” That’s what they say about wealthy people who are facing death. In the case of David Rockefeller who died at age 101, I thought about what might happen if he could take it with him? 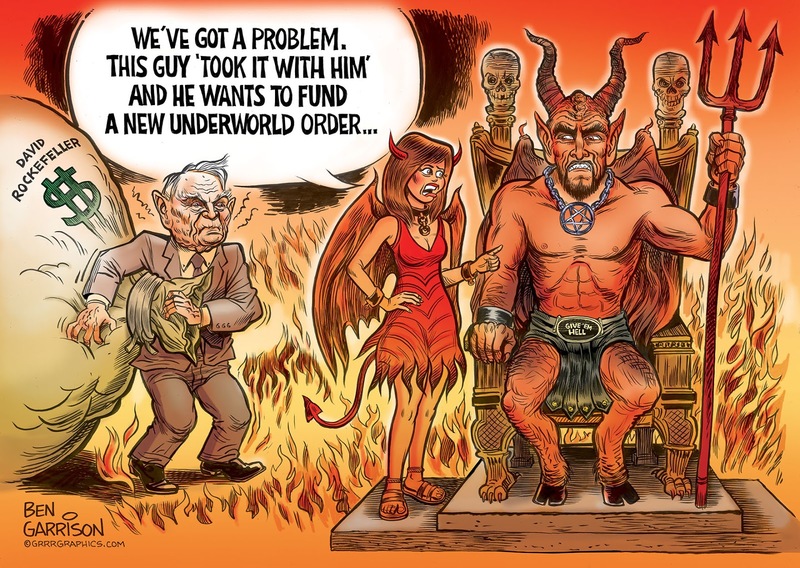 He’d no doubt do what he did on Earth—fund and control agendas as well as manipulate events and people who are on ‘his’ planet. It’s not about being comfortable, it’s about power. Tyrants tend to be reluctant when it comes to relinquishing power. Stalin in his old age was still carrying out purges. He was even planning on another war in Europe. After Stalin suffered what would be his fatal stroke, Khrushchev and others were reluctant to rush medical aid to him. They knew there were probably on one of his lists. Castro lived as long as he could and only reluctantly relinquished power to his brother. Chairman Mao wasn’t afraid of dying in his old age, but he resented dying mightily because he was terrified of losing his power. He loved it more than anything. All these men wanted to live forever, but nobody gets out alive. Similar to George Soros (another billionaire who refuses to die), Rockefeller was part of the Illuminati who operated behind the scenes. He funded a vast array of globalist initiatives that would often bring about conflict and tyranny. He was about tearing down western civilization and replacing it with something he owned and controlled. Again, just like Soros. He was a quintessential ‘new world order’ operative. He and his family bankrolled an alphabet soup of globalism including the UN, CFR, NAFTA, CAFTA TPP, WTO, IMF…on and on. Then there’s the Bilderbergers and Trilateral Commission and, of course, eugenics. He was eager to reduce the world’s population. Now it’s up to Bill Gates to do it for him. Do not rest in peace, David Rockefeller. You don’t deserve it.